Services Provided: I provide psychodynamically-based psychotherapy to individuals (13 years old and up) and couples, with a specialty in working with adopted adolescents, adopted college students, and adults. I have more than 40 years of clinical experience and am knowledgeable about life-cycle issues and believe that post-adoption services should extend far beyond services to families with adopted children. My treatment approach is primarily interactive, focusing on the patient’s goals for change and growth, with the patient deciding what issues have priority and respecting the patient’s boundaries. I bring in family members as needed and provide referrals to resources and services in the community. 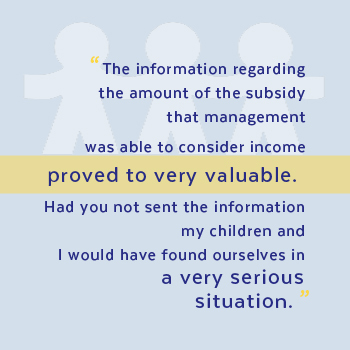 I am very knowledgeable about the meanings of the “search” for information about the circumstances of their being placed for adoption – and also about the wish many have to find their birth families and have co-authored 2 published articles about the meaning of the search. Insurance Accepted: Aetna, POMCO, modified sliding scale depending on need. Services Provided: I work with adoptive families, parents both pre and post adoptive and adolescent through adult adoptees, birth families and families in reunion. Transracial and GLBT adoptive families are a special area of focus in my practice. I also provide psychological testing and assessment for prospective adoptive parents when required for international adoptions. I have been in practice for over 15 years and am both an adoptive parent and a member of an extended birth family. Services Provided: Treatment Approaches: Dyadic Developmental Psychotherapy/Attachment Focused Family Therapy with children with Developmental Trauma Disorder (Complex PTSD) secondary to abuse, neglect, attachment disruptions and institutional care; Theraplay activities; Individual therapy with older adolescent and young adult adoptees. 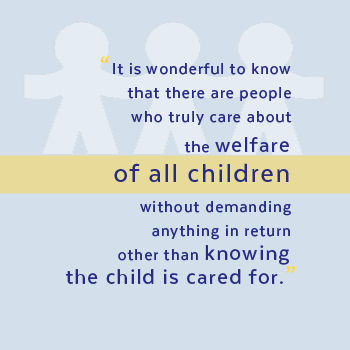 A major focus is Attachment Focused Parenting education and guidance and supporting parents. Ages: Infants through young adult; Adoptive parents. Serves Orange County,surrounding Hudson Valley counties, Northern NJ and NYC. Extended Saturday appointments for people who come a distance. Degrees/Licenses/Affiliations: MSW, LCSW. ACSW; Certified Dyadic Developmental Psychotherapist; Certified Attachment Focused Family Therapist; Member, Adoption Foster Care Therapists Network. Former Coordinator of a NYS OCFS Post Adoption grant through Abbott House; Adoptive parent. Insurance Accepted: I offer a sliding scale for payment if needed, and provide statements to be submitted to insurance for out-of-network reimbursement benefits. Services Provided: Licensed Clinical Social Worker in the State of New York with over 15 years of experience working in NYC foster care agencies in various roles. Trained in family systems theory and can provide pre and post adoption counseling. Currently, I am able to provide adoption home study services through all 5 boroughs, Nassau, Suffolk, Westchester, Rockland, Orange and Putnam Counties. 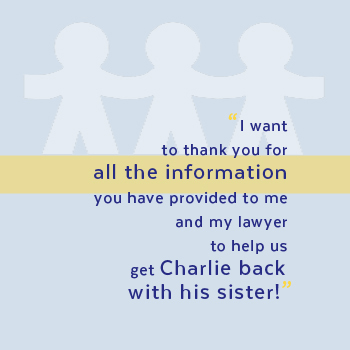 I will work with you and your attorney to complete the adoption home study. Insurance Accepted: Depending on your insurance, therapy services (Individual, couples counseling and family therapy) may be covered through your medical insurance coverage(see website for specifics). Sliding scale available. Services Provided: Steven has worked in adoption for twenty years, providing guidance and counseling to individuals and families whose lives have been touched by adoption. As a social worker with extensive training in adoption and as an adoptee, Steven understands the role and impact adoption has on individuals and families over a lifetime. Steven has worked with all members of the adoption triad, including those considering adoptive placement, those building their family through adoption and anyone considering adoption reunion. Services for prospective adoptive parents include the decision to adopt, home studies and post adoption assistance. 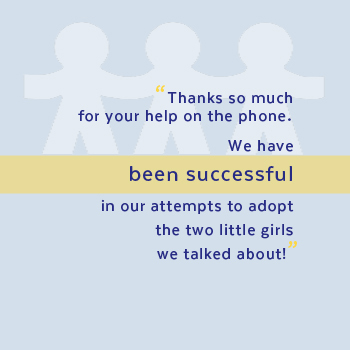 In person, telephone and online consultations available to anyone looking for more information regarding adoption. 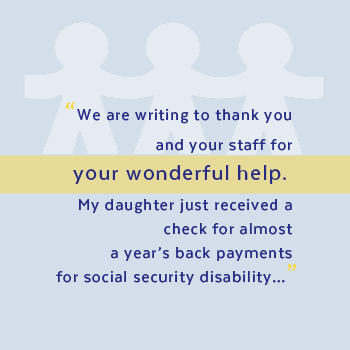 Beginning in April 2019, the Coalition’s Adoptive and Guardianship Assistance Program for Everyone (AGAPE) will grow to serve four more counties – Madison, Cortland, Cayuga and Chenango. In total, we will provide post adoption services through OCFS’s Regional Permanency Resource Centers. As the month progresses and we all have the opportunity to engage others in conversations about adoption, foster and kinship care, let’s make the effort to really listen to and elevate the voices of those most affected. 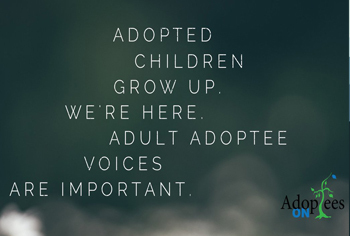 We need to look to the input of adult adoptees; to recognize their journey, celebrate their experiences, and value their voice. 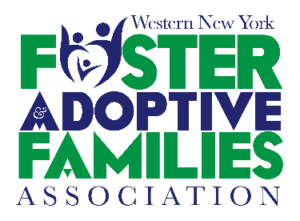 We’ll be coming to the Ithaca area soon and are looking to continue doing short interviews with foster parents interested in speaking about their experiences. If you are interested in participating, please fill out the form. 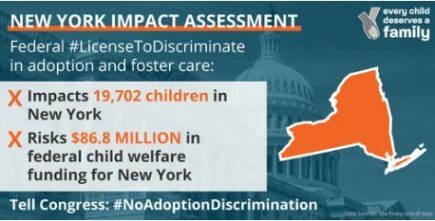 The “Aderholt Amendment” would allow foster care and adoption service providers across the country to discriminate against both children and potential parents based on sexual orientation, gender identity, religion, and marital status. A MENTAL HEALTH DIAGNOSIS, NOW WHAT? based programs to improve family relationships. relationships shape our identities as individuals and as a family unit. embraced and celebrated for the rich diversity this brings to all of our lives. This is Us has captured the attention of millions with its candid portrayal of families today, the intricacies of who and what constitutes family and how these relationships shape our identities as individuals and as a family unit. 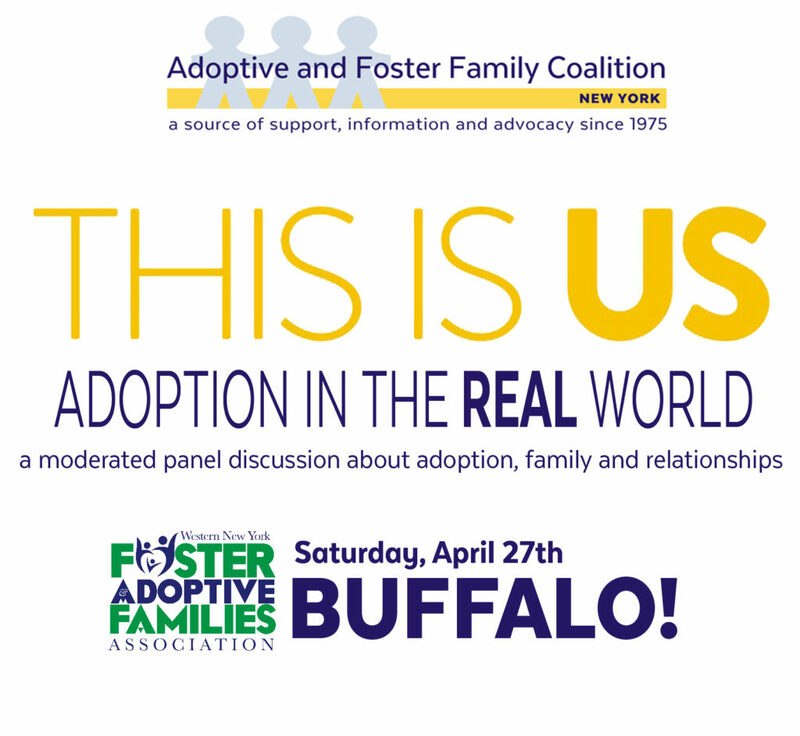 Please join the Adoptive and Foster Family Coalition of New York at the Western New York Foster and Adoptive Parent Association's Annual Spring Training ( see the flyer) for a real life discussion with our panel of characters including birth parents, adoptive parents, adoption professionals and, adopted persons. We will explore how we construct family today, the meaning this has for us, and how to create a social context in which today’s families are embraced and celebrated for the rich diversity this brings to all of our lives. 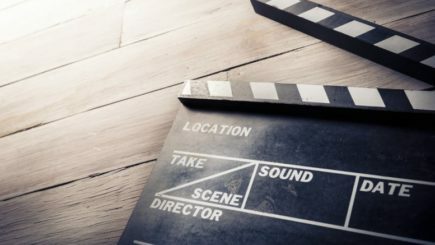 Television programming such as This is Us allows us to use a culturally relevant and timely media hit to have a deeper discussion about the complexities of families today, the realities of these experiences, and the need to educate our communities in order that all families have access to what they need to be strong. This Is Us: Adoption In The Real World will feature a panel of adoptees, adoptive parents, birth parents, caseworkers and others, talking honestly about adoption. Together, we will explore and discuss the way in which adoption and foster care impact all involved. We’ll also allow ample time for questions and answers. 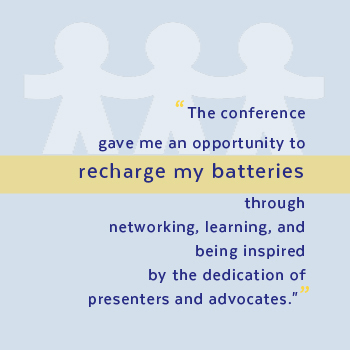 Please register for WNYFAPA 2019 Annual Spring Training here. A Free Workshop for Adoptive and Guardianship Parents raising children with adverse childhood experiences or difficult past histories. Building connections with your child before correcting their misbehaviors by using an attitude of play, acceptance, curiosity, and empathy. Supporting your child through their sometimes difficult behavior to get them back on track to more socially acceptable behavior. Concepts of self-care, figure out where your relationship with your child is blocked and how to deepen connections with them. This workshop is open to all adoptive and guardianship parents. Foster Parents also welcome, dependent on space. Child care and light dinner will be provided for every class. Tuesdays from 5:30 to 8:30 PM on 4/16, 4/23, 4/30, 5/7, 5/14, 5/21 and 8/20 at the Higher Hope Church on 356 Maple Street, Big Flats, NY. Please tell us about the children that will be attending with you. I attest that my family was formed by adoption or guardianship via a court order. I understand that the services provided by AGAPE are for adoptive and guardianship families. By indicating here, I understand that I may be asked by AFFCNY to provide proof of adoption or guardianship and certify that I will provide this documentation upon request.